Love libraries? Let’s fill the shelves. Me and the R.C.M.B. Tattoo trouble … yours for free! It seems every second person has a tattoo these days. Some are subtle—others are, ahem, regrettable. When it comes to tattoo trouble, I’m not having any—the only sharp, ink-carrying object I want anything to do with is my writing pen. I can’t say the same for my characters. Ink in a Blink has set up shop in Big Beaver County, and a few of my characters have been getting themselves into tattoo trouble at the local parlour. Don’t have a Kindle or free Kindle app on your mobile device? 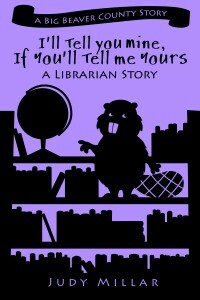 “I’ll Tell You Mine” is one of the stories in the full collection Beaver Bluff: The Librarian Stories, which is for sale in print (and electronically) on Amazon. Either way—enjoy! 2 Responses to Tattoo trouble … yours for free! 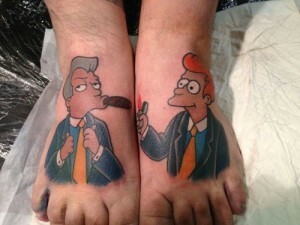 Clever people wait long enough till nature gives them their own tattoos – docs call them “varicose veins”. Welcome to my blog. If you want to subscribe by email, enter your address into the field below. If you'd rather connect on twitter, facebook or youtube - look up to those little icons in the header and pick one to click on. Colonoscopy cruise – all aboard! Laughter is the best medicine—unless you have diarrhea. 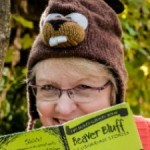 All site content © 2012 Judy Millar. All rights reserved.